It is one of the relatively few surviving abbey churches of the medieval period, and, although not a cathedral, is one of the biggest. It was founded by Benedict of Auxerre  in 1069 and subsequently built by the de Lacy family. On 31 May 1256, the Abbey was bestowed with the grant of a Mitre by Pope Alexander IV and from this date was a "Mitred Abbey". This privilege fell in abeyance a number of times, but on 11 April 1308, Archbishop William Greenfield confirmed the grant, and Selby remained a "Mitred Abbey" until the Dissolution of the Monasteries. Archbishop Walter Giffard visited the monastery in 1275 by commission, and several monks and the Abbot were charged with a list of faults including loose living, (many complaints referred to misconduct with married women). In 1279 Archbishop William de Wickwane made a visitation, and found fault with the Abbot as he did not observe the rule of St Benedict, was not singing mass, preaching or teaching, and seldom attending chapter. Things had not improved much in 1306 when Archbishop William Greenfield visited and similar visitations in later years resulted in similar findings. The community rebuilt the choir in the early fourteenth century, but in 1340, a fire destroyed the Chapter House, Dormitory, Treasury and part of the church. The damage was repaired and the decorated windows in the south aisle of the Nave were installed. In 1380-1 there was the abbot and twenty-five monks. In 1393 Pope Boniface IX granted an indulgence to pilgrims who contributed to the conservation of the chapel of the Holy Cross in the Abbey. The fifteenth century saw more alterations to the Abbey. The perpendicular windows in the North Transept and at the west end of the nave were added and the Sedilia in the Sanctuary was added. One of the final additions was the Lathom Chapel, dedicated to St Catherine, east of the North Transept, in 1465. In the Valor Ecclesiasticus of 1535 the Abbey was valued at £719 2s. 6¼d (equivalent to £431,191 in 2018). The abbey surrendered on 6 December 1539. The community comprised the Abbot, and 23 monks The abbot was pensioned off on £100 a year (equivalent to £65,937 in 2018)  the prior got £8 and the others between £6 6s. 8d. and £5 each. For a time after the dissolution, the church was unused but in 1618 it became the Parish Church of Selby. During the English Civil War and the Commonwealth period the building suffered with the north transept window being destroyed, and the statues on the brackets in the Choir were demolished. Like York Minster, the church rests on a base of sand and has suffered from subsidence. Many sections collapsed entirely during the seventeenth century, including the central tower in 1690 which destroyed the south transept. The Tower was rebuilt, but not the transept. In the eighteenth century the Choir was filled with galleries, and used for services, the Nave only used for secular purposes. The church was restored by Sir George Gilbert Scott in 1871–1873 who restored much of the nave for use, and again in 1889–1890 by his son John Oldrid Scott, who restored the choir. The tower was restored in the first few years of the twentieth century. The reredos was designed by Robert Lorimer and added in 1901. The organ builders from John Compton had been working until 11.00 pm on Friday 19 October, and shortly after midnight on Saturday the organist Frederick William Sykes spotted flames coming from the organ chamber. The organ builders had been installing a new kinetic gas engine to provide power to the new organ. Initial reports that the new organ equipment was to blame for the fire were later proved inaccurate. The fire destroyed the roof of the choir and the belfry and peal of eight bells was also destroyed. All of the interior fittings were also destroyed but thanks to the actions of the local fire brigade, the fourteenth-century stained glass in the East window was saved. A secondary fire broke out in the nave roof on the Sunday, but this was quickly extinguished. The abbey was rebuilt under the supervision of John Oldrid Scott at a cost of around £50,000 (equivalent to £5,119,000 in 2018)  and reopened in 1909. The restoration of the south transept was completed in 1912, funded by William Liversedge. In 1935 the architect Charles Marriott Oldrid Scott, son of John Oldrid Scott, raised the height of the towers at the front. In 1952 the Abbey was given Grade I listed status. In 1969 Selby Abbey became the first parish church to hold the annual service for the distribution of the Royal Maundy. The Abbey is currently undergoing an extensive restoration, costing several million pounds. Stage 6, the restoration of the Scriptorium was completed at a cost of £795,000. The £400,000 cost of restoring the South Choir Aisle and the 'Washington Window' was met in full by British American Tobacco. World Monuments Fund committed more than $800,000 to exterior work, including roof repairs, beginning in 2002. The tower is Norman, but the eastern end is in Decorated Gothic style, and the west front a mixture of Norman, Gothic and Victorian. The interior bears some similarity to that of Durham Cathedral, on which the design was modelled. Richly-carved and moulded capitals are found throughout the church. A major feature is the east window, which contains original medieval glass and depicts the Tree of Jesse, a popular subject of that period. The chancel stonework is thought to have been designed by Henry Yevele. 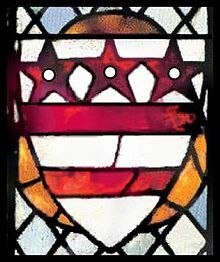 A notable feature of the abbey is the fifteenth-century Washington Window, featuring the heraldic arms of the ancestors of George Washington, the first president of the United States. The design, featuring three red stars above two red bands on a white shield, formed the model for the flag of the District of Columbia. The first organ since the reformation was installed in 1825 by Renn and Boston, in a gallery on the east side of the choir screen wall. This organ was rebuilt several times by Booth of Wakefield, Forster and Andrews of Hull and Conacher of Huddersfield. In 1868 the organ was rebuilt and moved to a bay in the choir. The opening recital was given by William Thomas Best. The organ was rebuilt in 1891 by James Jepson Binns of Bramley and moved again onto the north side of the choir. A rebuild took place by John Compton in 1906 but was soon afterwards destroyed by the fire. A new organ was built by William Hill dating from 1909, and two new organ cases were provided to designs by John Oldrid Scott, either side of the choir. This organ has subsequently been restored by Hill, Norman and Beard in 1950. Opening recitals were given by Francis Jackson and Melville Cook. Following this rebuild, the noted Italian organist Fernando Germani made a series of LP recordings at the Abbey for HMV which brought the organ to international attention. A further restoration took place by John T. Jackson in 1975. As of 2014, the organ is out of service awaiting a restoration. In 2002, Principal Pipe Organs provided a small chamber organ which is located in the chancel. The Bishop of Selby is a Suffragan Bishop to the Archbishop of York and oversees the Archdeaconry of York, which includes the Deanery of Selby. Selby Abbey is one of twenty members of the Greater Churches Group. ^ a b c Historic England. "Church of St Mary and St Germain (Selby Abbey) (1132591)". National Heritage List for England. Retrieved 29 August 2016. ^ "Selby and Tadcaster History". www.northeastengland.talktalk.net. Retrieved 16 May 2009. ^ "Restoring Selby Abbey: The Challenge We Face". Selby Abbey. Retrieved 23 May 2009. ^ "Washington Window". Retrieved 25 April 2013. ^ Thornsby, Frederick W., ed. (1912) Dictionary of Organs and Organists. Bournemouth : Logan. Wikimedia Commons has media related to Selby Abbey. Official website of Selby Abbey.